This is a slightly revised version of an article (updated 3 April 2009) which first appeared in the February 1999 edition of The Cartridge Researcher, the official bulletin of the European Cartridge Research Association. Additional information provided by Bob Mackenzie. The Second World War saw a major change in the nature of infantry anti-tank weapons. 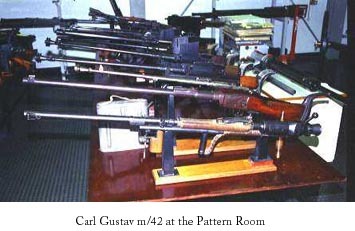 In 1939, most armies fielded large, high-velocity rifles in calibres varying from 7.92mm to 20mm. By 1945 these were virtually obsolete, replaced by much lower-velocity weapons firing large-diameter shaped-charge warheads capable of cutting through the thickest armour on the battlefield. While the British PIAT (Projector, Infantry, Anti-Tank) was a spigot mortar, two other types of weapon - the rocket and the recoilless gun - proved to be more successful bases for development and their successors are still in service today. In the middle of the war a strange hybrid appeared, from a nation not even involved in the fighting, which combined features from both eras; the Carl Gustav m/42. The problem of providing infantrymen with some defence against the tank appeared shortly after the tank itself. While the Germans discovered that the early British tanks were sufficiently slow and thinly-armoured to be vulnerable to direct artillery fire, it has always been an important principle of morale that the ordinary footsoldier should have some means of defending himself against the enemy's battlefield weapons, so the anti-tank rifle (ATR) was born. The first of the breed was the Mauser M1918, a huge bolt-action rifle based around a big 13mm cartridge, firing a bullet about four times heavier than the standard 7.92mm rifle at a similar muzzle velocity. This was capable of penetrating around 20mm of armour at 100 metres and 15mm at 300 metres, when striking at 90 degrees. As the early tanks carried no more than 12mm of armour, this was an effective weapon. Between the wars, many nations learned from the German experience and developed similar rifles. The British adopted the Boys rifle, virtually identical in principle but firing a slightly more powerful .55" (13.9mm) cartridge, with a performance only marginally better than the Mauser. The Soviets first tried a 12.7mm weapon which was a direct copy of the Mauser, then switched to a much more effective pair of guns - the PTRS and PTRD - designed around a massive new 14.5mm round. 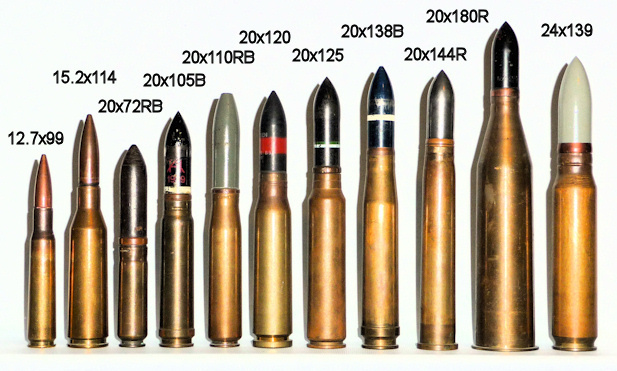 In the search for more performance without excessive size and weight, the Germans and Poles independently developed rifles in the standard military calibre of 7.92mm, but using huge cartridge cases to generate muzzle velocities of around 1,200m/s. Other nations took a less subtle route and chose massive 20mm cannon to achieve the necessary performance. There were two problems with anti-tank rifles; as tank armour rapidly thickened in the light of war experience, even the best of them proved inadequate; and attempts to increase performance led to huge, unwieldy weapons which needed a team to carry them. The best of the rifles - the high-velocity 14.5mm Soviet guns and the biggest of the 20mm cannon - were capable of penetrating up to 40mm of armour plate at short range, but this performance fell off rapidly with distance and even more as the striking angle departed from the vertical. In 1939, few tanks had more than 30mm of armour but double this was typical by the middle of the war, with three or four times as much by 1945. Then there was the problem of portability. The Mauser Ml918 weighed 17.3kg and was 1.68m long. The Boys rifle was fractionally shorter and lighter and the slim 7.9mm Polish Maroszek weighed only 9kg. These, however, were all marginal even at the beginning of the war. The much more effective Soviet PTRD probably achieved the best compromise between performance and portability, weighing only 16kg despite being nearly 2 metres long. Pity the poor infantryman firing it, however; the muzzle energy was almost double that of the Boys rifle! The big 20mm guns really pushed portability to the limit. There were some quite compact ones using low-velocity cartridges, but the most effective were the Solothurn Sl8-l000 and the Lahti L39, both based around the 20x138B round used in the German light FlaK cannon, and the Japanese Type 97 which used a 20x125mm cartridge. These weighed around 40-50kg (with the Type 97 tipping the scales at 68kg with its protective shield attached), but even these monsters were not much use by the middle of the war. Fortunately for the poor infantryman, various nations were trying to make use of shaped charge warheads, in which an explosive detonated around a metallic cone generates a narrow jet of molten metal at extremely high velocity and with remarkable cutting effect. It was clearly a useful principle against armour if only a convenient method could be found of projecting it from a distance. As already described, the British introduced the PIAT, which fired a 1.36kg warhead capable of penetrating 10cm of armour. It weighed 14.5kg and was only 99cm long, but suffered from heavy recoil. The Americans introduced the bazooka, which avoided the recoil problem by utilising a tube-fired rocket. The Germans developed a range of recoilless guns, most notably the Panzerfaust shoulder-fired weapon, as well as copying the bazooka principle. 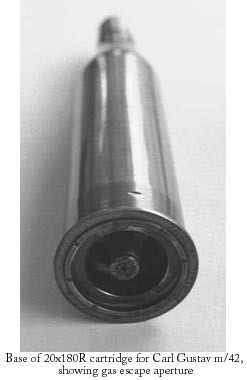 The counter-recoil method of achieving recoilless firing had been known for decades and the American Davis gun (which achieved this by firing an equal weight of shot to the rear) had seen service in the Great War, but the Germans perfected the method of diverting rearwards some of the high-velocity gas from the propellant charge in order to balance the recoil. These were all effective devices, limited principally by the low velocity which gave them a steep trajectory and an effective range against moving targets of around 100m. The Swedish firm of Carl Gustav were also experimenting with recoilless weapons but with a different aim; to reduce the weight and recoil of a high-velocity, small-calibre weapon. This work started in 1940 and resulted in the unique 20mm m/42. In effect, this combined the old principle of defeating armour by means of high-velocity solid shot with the latest technology to reduce size and weight. It was designed around an enormous cartridge with a case some 180mm long, necessary because of the diversion of much of the propellant to provide rearwards thrust via a blowout base to the cartridge case. It was a single-shot weapon, manually loaded via a simple lever-operated side-hinged breech containing a single exhaust cone, and the gun was designed to rest on the firer's shoulder to ensure that the back-blast did not injure him. The gas exited the gun via a hole in a plate which formed a part of the breechblock. This was gradually eroded by gas pressure and had to be replaced after each twenty AP rounds were fired, and after each forty HE and practice rounds (the AP rounds were loaded to a higher pressure); the state of wear of this plate affected the muzzle velocity. The sights were calibrated for 300m. A 1943 assessment of factory drawings by no less than Dennis Burney of the Broadway Trust Company (designer of the recoilless Burney guns) estimated a muzzle velocity of 800-820m/s, but it appears that he was assuming a heavier projectile, as most 20mm AT weapons had bullet weights of 130-150g. In fact, the m/42's projectile weight was 108g and the muzzle velocity around 950m/s. 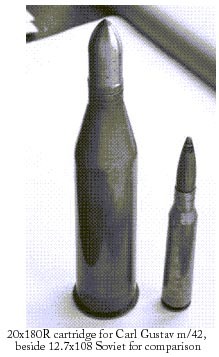 The AP shot had a tracer and was known as the slpprj m/42; unusually for an ATR, there was also an impact-fuzed HE projectile known as the sgr m/43. Burney had some interesting technical comments to make, comparing the design with his own very similar 3.45" recoilless gun. He estimated that the size and shape of the exhaust jet in the breech would limit the recoil absorption to about 80% but that it was capable of improvement and was basically a satisfactory design. Interestingly, he suggests that its main use could be as a sniping weapon. The gun was clearly capable of matching the armour penetration of the best of the existing anti-tank rifles, yet it was far smaller and lighter at only 1.4m long and 11.2kg. Unfortunately, by 1942 this performance was no longer sufficient to be worthwhile. Despite this, orders for 3,219 ATRs were placed, with deliveries between August 1942 and July 1944. The first 500 were faulty, and used only for training until they were repaired. By the end of the war only 1,000 had been delivered. There can be no doubt that the main value of the m/42 was to provide experience which led the firm to the development of the famous 84mm Carl Gustav recoilless gun, first introduced in 1946 and still in widespread use today. 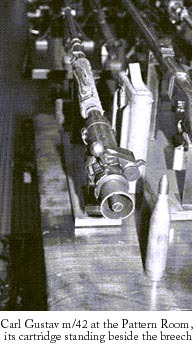 A range of ammunition types is available and the handy 14.5kg gun has even seen action in British hands as an anti-ship weapon - in South Georgia in 1981. A postscript to this story is that 20mm Anti-Materiel Rifles have recently been making a come-back. Two of them are South African, the NTW 20 (available in both the 20x82 MG151 and 20x110 Hispano calibres) and the Truvelo (20x110). In addition, Croatia makes the RT20 (20x110), while Slovenia has offered the Alpimex (20x82) and Finland the Helenius in 20x99R ShVAK. However, all of these are bigger and heavier than the m/42 and, despite a token attempt at recoil-reduction in the RT20, are definitely not recoilless! The assistance of the Custodian and staff of the Ministry of Defence Pattern Room, UK, is gratefully acknowledged. Letter from Dennis Burney of the Broadway Trust Company to the Ministry of Supply Armaments Design Department, dated 25th November 1943 (held at the Pattern Room). Anti Tank Rifle Ammunition (Peter Labbett - in Guns Review, February 1984).